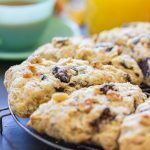 Perfect scones, tender and moist, with crispy edges, chock-full of cocoa, chocolate, dried tart cherries, and infused with coffee! 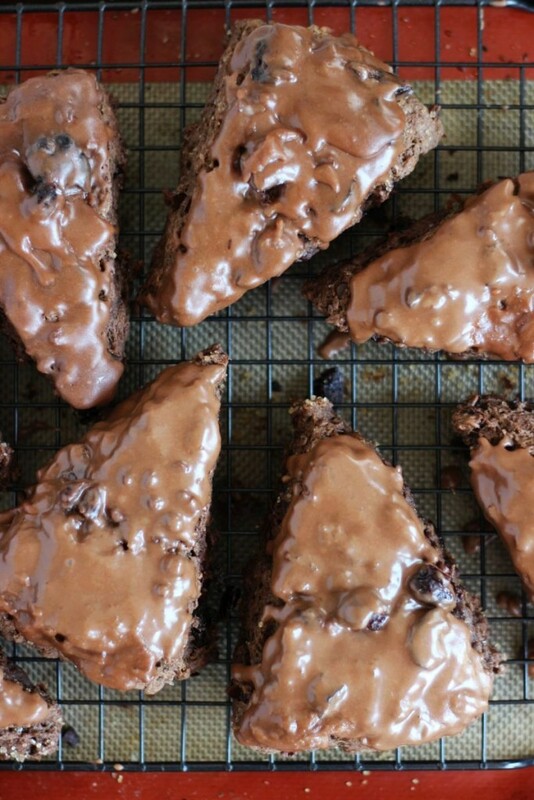 These Chocolate Cherry Mocha Scones with Chocolate Glaze are also dunked in a bath of rich, divine chocolate glaze! I love how rustic these scones look. I see other bloggers do moody and dark photos, but when I try, they just look underexposed and basically unlit. Dark, drab, and lacking in color and vibrancy. 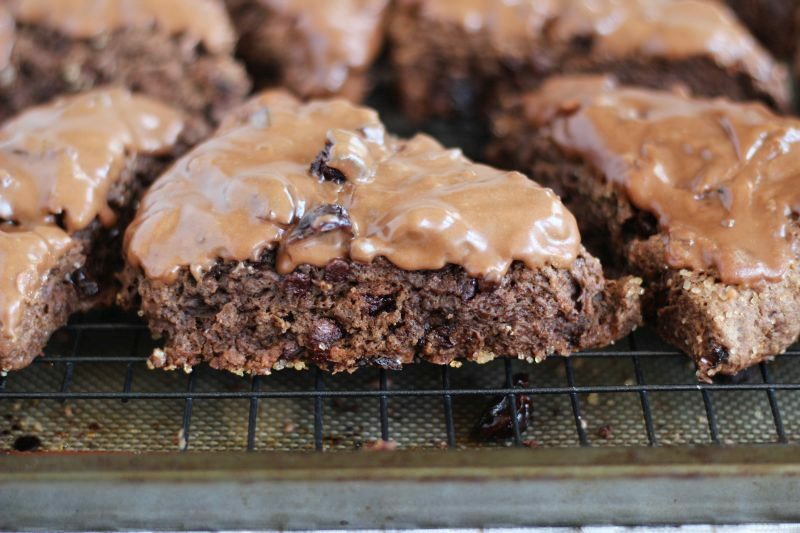 These Chocolate Cherry Mocha Scones with Chocolate Glaze were naturally rustic in the photos though. If only I could create that effect purposefully. More about the food. That glaze. The glazzze!! That chocolate glaze is the best. Sweet, chocolatey, and thick, but still drippy. Powdered sugar and cocoa are whisked with vanilla and melted butter. The melted butter helps the glaze taste more rich, and also helps it to set so that it’s not a total mess. Next up, donuts. I’m repurposing that glaze recipe for donuts soon. It’s perfection. The scones. Scones are one of my FAVORITE things to bake. I’ve made a ton. 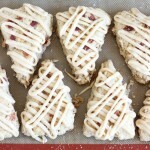 Some favorites are these Brown Sugar Maple Bacon Scones with Maple Brown Butter Glaze. They are incredible. 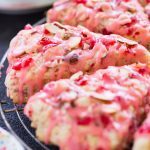 I also love these Cranberry Orange Scones with Orange Glaze, these Sweet Potato Pecan Pie Scones, these Pumpkin Pecan Scones with Brown Sugar Streusel, and the scone that started it all: Pomegranate White Chocolate Almond Scones. That’s not even all of my scones recipes. Those are just a few of my favorites. 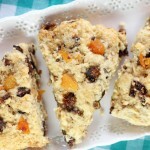 Most of the scones recipes on the blog here will give you scones in 30 minutes, start-to-finish, warm from the oven. 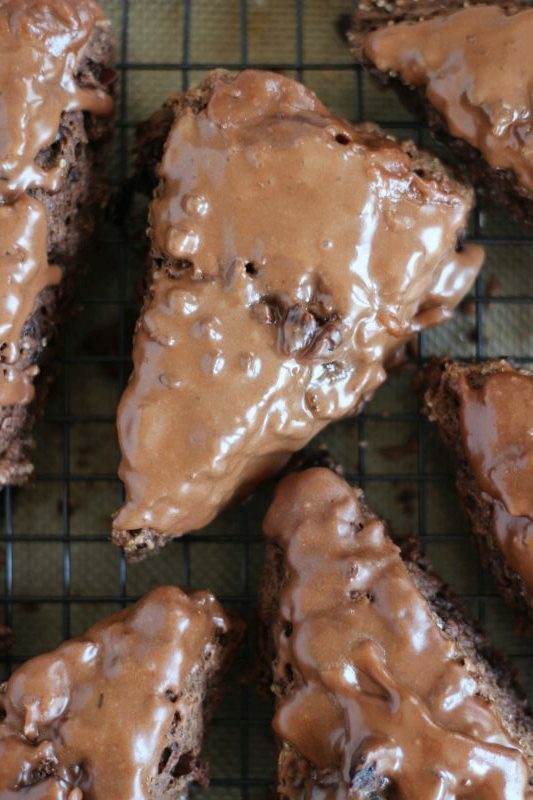 They are one of the quickest baked goods you can make. 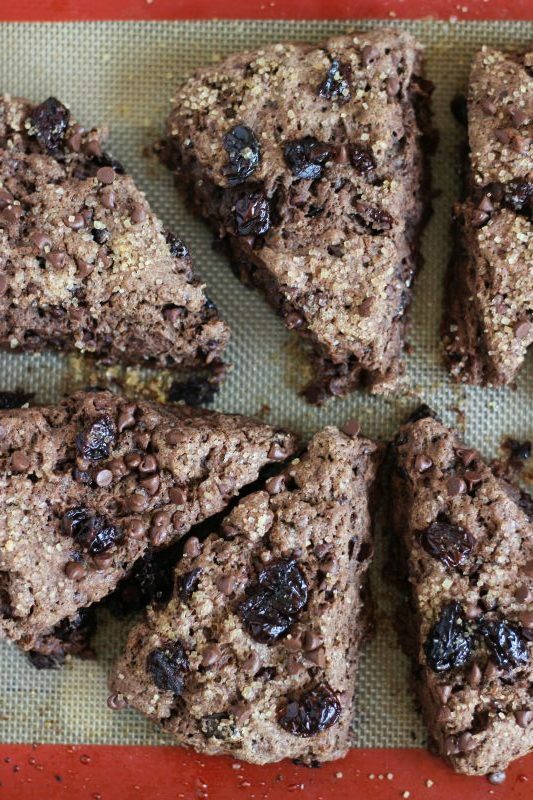 The basic scone recipe that I’ve relied on for several years now is the absolute best. It’s completely foolproof, no matter how I adapt it, and it produces scones that have crispy edges, and are moist, buttery, and flaky. 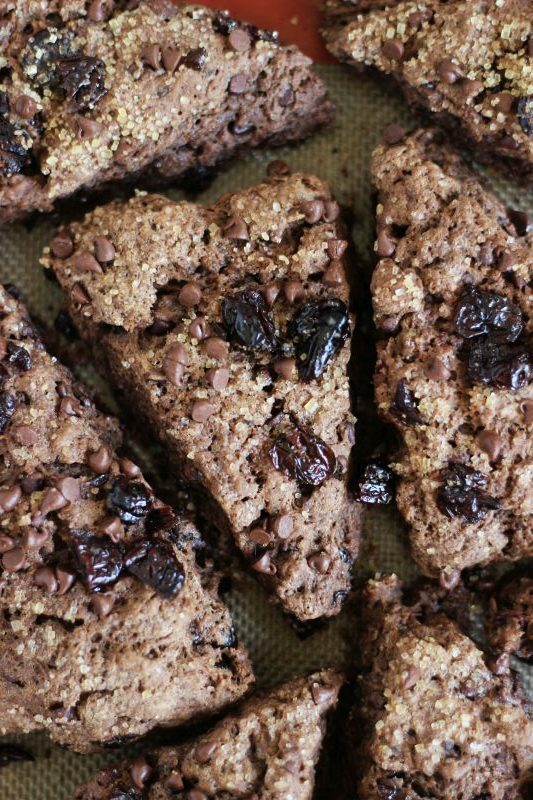 Anything but a dry and bland scone that you’d find at most coffee shops. They are delightful. 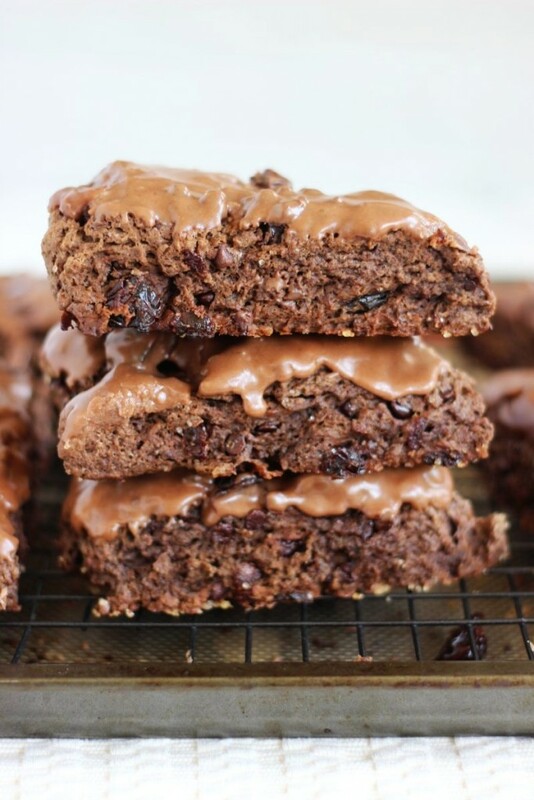 These Chocolate Cherry Mocha Scones with Chocolate Glaze are rich with cocoa, infused with coffee, and filled with dried tart cherries. And mini chocolate chips! 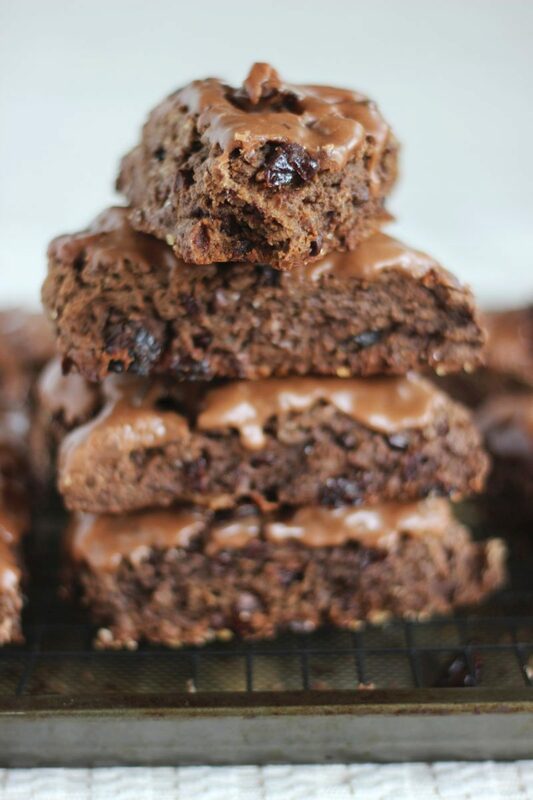 I love using mini chocolate chips because they diffuse the chocolate so well into baked goods. The cherries provide both sweetness and tartness, and are a beautiful contrast to rich chocolate. The coffee granules enhance the chocolate, giving it a deeper, roasted vibe. 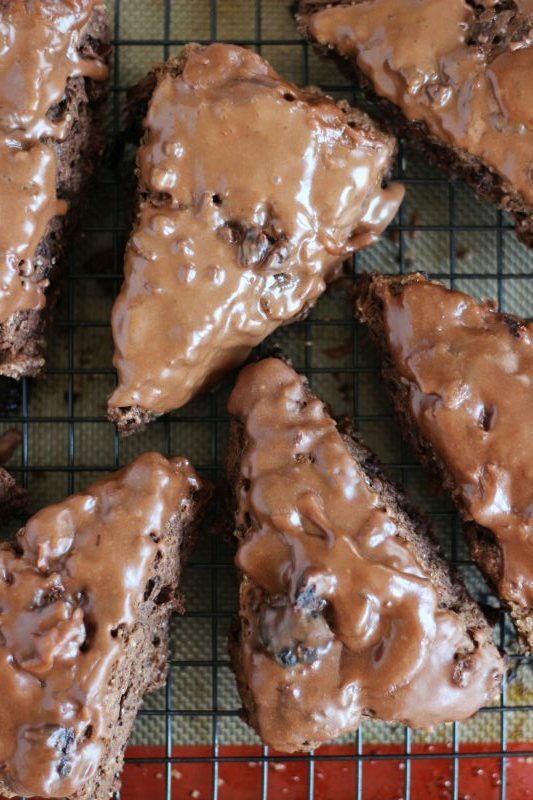 The thick chocolate glaze definitely sends these Chocolate Cherry Mocha Scones with Chocolate Glaze over the top! Sweet and indulgent, but still acceptable for breakfast. Your weekend brunch menu is looking excellent. 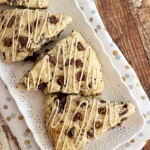 Perfect scones, tender and moist, with crispy edges, chock-full of cocoa, chocolate, dried tart cherries, and infused with coffee! 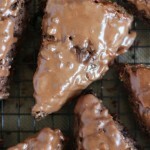 They are dunked in a bath of rich chocolate glaze! In a large bowl, combine flour, cocoa, sugar, baking powder, instant coffee, and salt. Grate the butter into the flour mixture using a grater, and mix until it resembles coarse crumbles. Stir in chocolate chips and cherries until evenly distributed. In a small bowl, whisk together eggs and 1/2 c. cream. Make a well in the center of the flour mixture, and pour the egg mixture into the well. Mix until just combined. Turn dough out onto a lightly floured surface, and knead dough 6-8 times, then form it into a large ball. Place onto a greased baking sheet, and carefully flatten the ball into a large disk, about 1-inch thick. Brush each scone lightly with cream, and sprinkle with a pinch of sugar. Bake at 400 degrees for 12-16 minutes, or until edges are golden brown and scones appear set. Combine all glaze ingredients in a medium bowl, and whisk til smooth, adding water as needed to achieve desired consistency. It shouldn't be too runny - we want it to be thick enough to stay on the scone without too much dripping off. Dunk the warm (but not hot) scones in the glaze, and allow a few minutes for the glaze to set. Enjoy! These sounds delicious! In my family, I’m the queen of scone baking! Excuse my ignorance, but how much is in “1 packet of instant coffee granules”? Would that be 1 teaspoon? Or, a tablespoon? I just have never seen instant coffee in packets before (at least not where I live!, which is in Saskatoon, Saskatchewan, Canada). I’ll be making these scones real soon! Thanks for the recipe, Sarah! Hi Deb: I’m sorry I missed your comment sooner! I don’t know how much is in a packet, but I used Starbucks via, and if I measure it out, it seems to be about 2 teaspoons. I hope that helps, and I hope you like the scones!! Thank you!